Information in this executive summary was correct as at February 2017. The SEND Partnership Board has launched the SEND 2020 programme to improve special educational needs and disability (SEND) services in Surrey. As part of this programme we will agree a joint commissioning approach. This will enable us to provide joined-up services so that children and young people with SEND have the same opportunities in life as their peers. To achieve this, it is important that we develop a shared understanding of the needs of children and young people with SEND. The 2011 census showed that in Surrey there were 4,094 children aged between 0 and 24 whose day-to-day activities were limited “a lot” and 6,942 whose day-to-day activities were limited “a little”. In 2016 there were 5,750 children with Statements of Special Educational Needs (SSEN) and Education, Care and Health Plans (EHCPs) maintained by Surrey, and a further 296 attending Surrey state funded schools with statutory plans maintained by other local authorities (1). 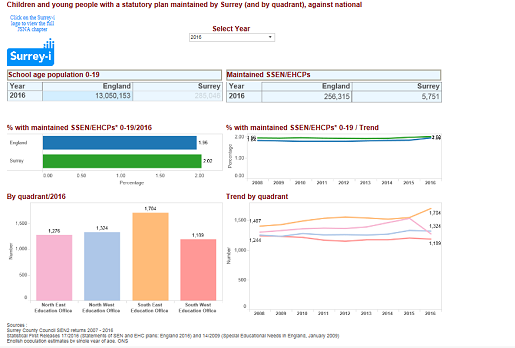 A higher percent of children and young people in Surrey have statutory plans (3.1%) compared to nationally (2.8%) (2). It is estimated that there will be around 6250 children and young people in Surrey with EHCPs by 2020, and 6500 children 2025, an increase of around 900 (16%) (3). The number of children and young people who need a SSEN or an EHCP has risen by 7.3% from 5,360 in 2010 to 5,750 in 2016, this is above the population increase of young people in the same age range (4). The number of statemented children and young people identified with autistic spectrum disorder (ASD) has increased by around 50% since 2009. Not all children with a diagnosis of ASD or other special educational needs or disabilities necessarily need a plan; many children and young people with SEND have their needs met through SEN support, timely intervention and support from teachers, health professionals and other experts. Overall, ASD in Surrey schools has increased by 89% from 1,258 pupils in 2010 to 2,378 pupils in 2016 (5). Around 15% of children with special needs are placed by Surrey in non-maintained institutions (NMIs), which may be in Surrey or further afield. This is a jump of over a third (36%) over the last five years, and is more than double the national average (6.9%) and considerably above the statistical neighbour average (8.5%) (6). Children and young people with SEND account for 7.7% of hospital admissions in the age group from birth to five years (7). Seven in ten looked after children who have been looked after for at least 12 months have some form of SEND (8). In Surrey there is a wide gap in attainment between children and young people with SEND and their peers. Children and young people with no additional needs have historically higher educational attainment compared to the national and statistical neighbour average. However, Surrey’s children and young people with statutory plans have consistently lower attainment at school than our statistical neighbours (9). In 2015/16 Surrey County Council carried out analysis of the customer experience of children and young people with SEND and their families (10). While pockets of good practice were identified, the feedback from parents, carers and young people in need of SEND services highlighted an uneven and fragmented experience of the system. In 2015/16 representatives from Surrey’s SEND 2020 Programme undertook visits to a number of local authorities with a track record in developing effective arrangements for children and young people with SEND to identify learning opportunities for Surrey. Common themes included the importance of aligning SEND services to early help and family support services, robust parent participation and partnership working, and the benefits of a team around the child/family approach. integrating education, health and care in assessment planning, delivery and review. defining new, integrated pathways with seamless transition points. optimising the system to deliver agreed outcomes in a way that delivers customer satisfaction and an improved journey within agreed financial budgets. ensuring service design supports accessibility and an early help approach. creating more early years’ specialist SEN placements, special school and special unit places, college placements and pathways to adulthood including employment opportunities and supported living to meet needs arising in the county. developing local inclusive networks of schools and sharing and celebrating good practice. supporting providers to deliver effective SEND intervention and support. ensuring equality of support for children from birth to adulthood across Surrey. A shared understanding of the needs of children and young people with SEND presents Surrey County Council and its partners with a range of opportunities and challenges to fulfil on the ambition of Surrey’s SEND 2020 Programme and related commissioning activity. In a joint partnership workshop on 16 March 2016, Surrey County Council and its partners identified a number of key themes (areas of improvement, opportunities and challenges) to guide commissioning activity. The Council and its partners agreed that the principle of early help underpins Surrey’s approach to SEND. Early help is a way of thinking, a way of doing and is everybody’s business. Surrey County Council is committed to working together with schools and partners to identify needs and provide the right support at the earliest opportunity for children, young people and their families in Surrey. Surrey’s vision is for all children and young people to be happy, healthy, safe and confident in their future. Those with special educational needs and disabilities often face extra barriers to achieving this and require the right support to enable them to achieve their goals. In delivering this vision we recognise the need to respond to growing demand for services for children and young people with SEND, new legislative requirements in the Children and Families Act 2014 and reduced funding. Feedback from parents, carers and young people has also highlighted an uneven and fragmented experience of the system. In response, the SEND Partnership board created the Surrey SEND 2020 programme. As part of this programme Surrey County Council and its partners will agree a joint commissioning approach. This will enable the council and its partners to provide joined-up services so that children and young people with SEND have the same opportunities in life as their peers. To achieve this we need a shared understanding of the needs of children and young people with SEND. Surrey County Council undertook a comprehensive analysis of the needs of children with SEND in 2015/16. This JSNA chapter provides an overview of these findings, as well as a summary of the customer experience of SEND services, current services in relation to need, and other possible service models drawing on the council’s visits to other local authorities in the same period. The chapter concludes by identifying the key commissioning recommendations that Surrey County Council and its partners have committed to, and comments on the opportunities and challenges facing the council and its partners drawing on the themes of a joint workshop with SEND partners on 16 March 2016. The term Special Educational Needs (SEN) has a legal definition which is set out in the Education Act 1996 and the Children and families Act 2014, Part 3, referring to children who have learning difficulties or disabilities that make it significantly harder for them to learn or access education than most other children of their age. The Children and Families Act 2014 expands support to children and young people from 0 to 25 through Education, Health and Care Plans (EHCPs). The Equality Act 2010 defines disability as ‘…a physical or mental impairment which has a long-term and substantial adverse effect on their ability to carry out normal day-to-day activities’. This definition provides a relatively low threshold and includes more children than many realise since ‘long-term’ is defined as ‘a year or more’ and ‘substantial’ is defined as ‘more than minor or trivial’. Children who have a physical disability or learning disability are more likely to have a health need, and there can be cross over between children that have SEN and have a disability, and some children with a disability may not have special educational needs. Categories are used to further breakdown and identify the primary need of the young person which describes the condition that the child is most likely to need support for. Surrey has developed its own framework for categorising the primary needs of children with SEND to improve modelling and join up with schools. There are an estimated 1.8 million children and young people up to the age of 25 in the UK with SEND, categorised by varying levels of need (12). In Surrey, the 2011 census revealed that there were 4,094 young people aged between 0 and 24 whose day-to-day activities were limited “a lot” and 6,942 whose day-to-day activities were limited “a little” (13). In 2016, there were 5,750 children with a statutory plan maintained by Surrey(14) and in 2015 there were 5,850 children with a SSEN attending Surrey Schools including Non-Maintained Independent (NMI) schools (15). Surrey has a higher prevalence of SEND in its young population with 3.1 per cent of its population in receipt of a statutory plan, compared to 2.8 per cent nationally (16). The headline findings from Surrey’s needs analysis reveal a number of strands to the SEND story in Surrey (17). Increasing need for learning pathways for children post-16 and post-19 that support preparation for adulthood, including employment and more independent living. Many children’s needs overlap or vary, therefore there may be children that have a statutory plan but are not on the disabilities register, and do not record themselves as having daily living limited a lot or receive services from social care. Headlines from summary paper ‘The SEND challenge: growing levels of need’ (19). 7.3% rise in number of young people with special educational needs or disabilities. The number of children and young people who need a statutory plan has risen from 5,360 to 5,750 (7.3%) since 2010, outstripping the demographic increase of young people in the same age range. In the four areas of Surrey, South East has the highest proportion of children and young people with EHCPs. 50% rise in number of Surrey children and young people with autism and a SSEN. The number of statemented children and young people identified with autistic spectrum disorder (ASD) has increased by around 50% since 2009. Looking at the overall level of need and including children and young people with autism who have their needs met through SEN support, ASD in Surrey schools has increased by 89% from 1,258 pupils in 2010 to 2,378 pupils in 2016. Some other needs have decreased – e.g. moderate learning difficulties (MLD) and specific learning difficulties (SPLD). This is likely to be the result of changes in diagnoses. Surrey places twice as many children in the independent sector as other areas. Around 15% of children with special needs are placed by Surrey in non-maintained institutions (NMIs), which may be in Surrey or further afield. This is a jump of over a third (36%) over the last five years, and is more than double the national average (6.9%) and considerably above the statistical neighbour average (8.5%). The number of young people in independent specialist colleges (ISCs) has jumped sharply following the Children and Families Act 2014, from 86 in 2014 to 115 in 2015. Seven in ten Looked After Children who have been looked after for at least 12 months have some form of SEND. In 2013, 36.7% of the 370 children who had been continuously looked after for at least 12 months and a further 33.7% had SEN without a SSEN – a total of 70.4% with some form of SEND. The number of children receiving social care support through the children with disabilities teams continues to rise steadily, from 809 in September 2013 to 823 in August 2015. The number of young adults supported by the transition team has nearly doubled in three years. The group of young people being supported has expanded from 453 to 890, an increase of 96%. Surrey’s children with SEND fall behind other similar local authorities (statistical neighbours) in educational attainment at all age ranges. Surrey’s young people with SEND also have lower post-school outcomes than other pupils. The number of children and young people with SEND is going to increase. It is likely that there will be around 6250 children with EHCPs by 2020, and 6500 children with EHCPs by 2025, an increase of around 900 (16%) (20). The number of young people on statutory plans and EHCPs will increase considerably following the raising of the participation age and the Children and Families Act 2014. Based on current assumptions it is likely that Surrey will see an even more rapid increase in the number of EHCPs post-16 than for younger, school-aged children. 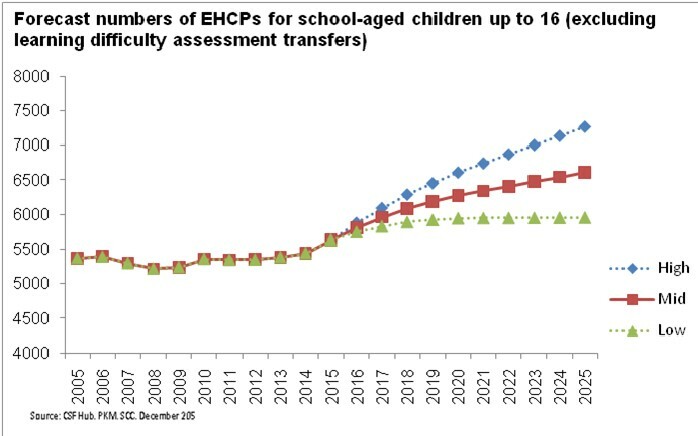 The chart below shows the results of Surrey County Council’s forecast of the projected number of children with EHCP’s based on the most recent six years of data. The mid projection suggests that there may be approximately 6500 children up to the age of 16 with an EHCP by 2025. N.B. The range between the low to high bands increases overtime due to the increasing levels of uncertainty that exist when modelling further in the future. 7.3% rise in number of young people with special educational needs or disabilities. 50% rise in number of Surrey children and young people with autism and a SSEN. For many children and young people additional needs will not become obvious until they are in school and seen alongside their peers. A higher proportion of Surrey’s school population receive statutory plans than many comparable Local Authorities. Further work is needed to understand the causes behind this. Possible factors include: families in Surrey being more aware of what support they can receive; better and earlier recognition of difficulties by schools; a preference of schools to request external resources and support; parents choosing NMI placements and requiring an EHCP to do so. In January 2016, there were 5,750 students with statutory plans maintained by Surrey. Overall there are 390 more statutory plans in 2016 than in 2010, an increase of 7.3%. For the period 2010 to 2016 this increase was below the national trend of a 12.3% growth in the number of statutory plans. 71% of children with a statutory plan are White British, 5.6% are Asian, 4.7% are mixed/dual backgrounds, 1.3% are Black or Black British, 0.27% are Chinese and 1.6% are Roma/Roma Gypsy. White British young people make up 80% of Surrey’s total 0 – 25 population suggesting that the proportion of other ethnicities with SSEN are over represented. This reflects the national picture. The 11-15 age group is the largest cohort of children with statutory plans maintained by Surrey (45%), followed by children aged 5 to 10 (39%). Of the 370 children who had been continuously looked after for at least 12 months at 31 March 2013, 36.7% had SEN with a statement and 33.7% had SEN without a statement, a total of 70.4% with some form of SEND. This is higher than Surrey’s general population at 14%, lower than the regional average for looked after children at 71.7%, but higher than the national percentage at 67.8%. There has been a 50% rise since 2009 in the number of children and young people with statutory plans reporting their primary need as autism. This increase could be due to a number of factors including increased awareness and better diagnosis. In 2015, the highest numbers of children with SEND were in years 7 to 9. There are differences in the types of need according to the age profile of secondary school children. Children with Speech, Language and Communication Needs (SLCN) and Physical Disabilities (PD) were most prevalent amongst children in year 7, whilst Autistic Spectrum Disorders (ASD), Social, Emotional and Mental Health (BESD) and Moderate Learning Difficulties (MLD) were most prevalent amongst students in year 11. Surrey places twice as many children in the independent sector as other areas. Surrey is working to develop the in county special school offer and develop more inclusive practice which would reduce the number of children being educated in NMIs, and out of county. However, Surrey currently has significantly more children educated in NMIs compared to the national and statistical neighbour average. Although some NMIs meet a gap in provision and are value for money, some NMI and out of county placements are considerably more expensive than alternative provision, and may not always deliver the best outcomes for the individual. The majority of pressure for NMIs comes from secondary school pupils (7-11). 85% of children in national curriculum year -1 (23). However, 85% of children in national curriculum year -1 are placed in NMIs. While there appears to be some relationship between the proportion of pupils with a statutory plan and free school meals as a proxy for deprivation, the percentage of NMI placements bears little relationship to either the number of SSEN or deprivation. Surrey’s placements are most often within the county with 55% of placements at independent and non-maintained special schools (INMSS) within the Surrey County Council’s geographical area. However this is comparatively low compared to other councils. More than double the proportion of Surrey children and young people with statutory plans are educated in NMI and independent provision than the national average, with a lower proportion educated in maintained or academy special school provision in Surrey. This cohort of children could be both Surrey residents and children that are residents in other counties but are being educated in Surrey schools. These schools are Surrey maintained schools, pupil referral units, special schools and academies. It does not include NMIs or alternative provision. There are 4,717 students with statutory plans attending Surrey maintained schools. Boys outnumber girls by over two to one with 1,295 girls and 3,422 boys (25). The majority of children with statutory plans have ASD; the next largest group is Speech, Language and Communication Needs (SLCN). SLCN is the only primary need that appears to decline between the ages of 5 and 15 and sees the fastest increase from the ages of 4 to 5. The South East is most likely to send children out of county to be educated with 193 children educated outside the area. This compares to the South West who only have 101 educated outside. The majority of children in Surrey that are schooled out of county are those with Complex Social Communication Needs CSCN/ASD (29%), followed by children and young with physical disabilities (19%). This could suggest that there is not enough specialist provision in Surrey and/or indicate increasing numbers. The majority of children educated out of Surrey are in independent provision (60%) however, a significant proportion are placed in local authority maintained provision which raises the question of why these children are not educated within Surrey’s maintained schools. The largest proportion of children educated outside Surrey are in West Sussex with 15% (88/575). Hampshire has the second highest proportion with 14% (81/575). Providing support at the start of a child’s life is essential particularly where there may be additional needs emerging. The largest proportion of children receiving support from the Early Years service with additional needs aged 0-5 receive Early Years Action Plus (30%). This number has come down slightly since 2013 (43%) and 2012 (39%). As at February 2016 there were 173 early support cases and 70 cases on the waiting list. There is a need to ensure holistic early support is available for children and families where there are multiple needs identified during early years. The Early Support team has implemented a strategy for supporting these families by assessing the level of need and providing one off visits or signposting to other services that could be an option for the family. However, this means they do not get the full service that could be made available and make a difference as the child gets older. 50% rise in number of Surrey children and young people with autism. In 2012 there was a significant rise in children with statutory plans attending mainstream non-maintained independent institutions. Up to then there had only been children in NMI special schools. 2015 saw the fewest number of children in other Local Education Authority’s mainstream schools which reflects the efforts that Surrey County Council has made to increase mainstream school places, although the numbers in special schools have remained consistent. The past two years have also seen an increase in the numbers in special schools, as opposed to mainstream environments. This has happened at the same time as a decrease in children attending mainstream schools so cannot be wholly put down to an increase school population with SEND and lack of school places. However, it could be reflective of students with more general needs using more school places and resulting in those children with additional needs requiring alternative provision. More work is required to understand the factors behind this. Supporting young people with additional needs to achieve better outcomes, by accessing education or further training and employment that helps them to progress to independence is a priority for the SEND 2020 programme. The categories of SEN children that are most likely to not be in education, training or employment (NEET) are those with Social, Emotional and Mental Health (SEMH) and Moderate Learning Difficulties (MLD). Surrey’s children and young people with no additional needs have historically higher educational attainment compared to the national and statistical neighbour average. However, Surrey’s children and young people with statutory plans have consistently lower attainment at school than our statistical neighbours. In 2013/14, at GCSE and equivalent for pupils at the end of key stage 4 (KS4), 9% of children with statutory plans achieved five or more A* to C grades, compared to 8% nationally and 12.9% among statistical neighbours. In 2014, 17% of children with a statutory plan achieved level 4 or above in key stage 2 (KS2), reading, writing and mathematics, compared to 15% nationally and 19% regionally. In 2015, more pupils with a statutory plan (5.17%) were excluded in all quadrants in comparison to those without statutory plans (0.69%) However, the number of children with statutory plans being excluded is decreasing. In 2015, a higher proportion of those with statutory plans (0.33%) were permanently excluded when compared to those with SEN support (0.23%) and not SEN (0.02%). The number of permanent exclusions has increased over time from a negligible level in 2011/12 to 0.30% in North East Surrey in 2014/15. Despite being one of the more successful local authorities in supporting all KS4 pupils (95%) into further education or training, Surrey is in the bottom 3 (compared to statistical neighbours) in supporting KS4 pupils with a statutory plan (89%) or School Action/School Action Plus (84%) into further education, or training. Surrey’s cohort on School Action Plus have historically underachieved in school in comparison to their School Action counterparts. This may be due to children on School Action Plus having higher levels of need but not quite reaching the threshold for statutory plans. Therefore in national reports, Surrey may see the educational performance of children with SEN Support being below the regional and national average due to the assessment of the entire cohort. Evidence suggests that the demand placed on health services by children with SEN is declining in the long term but has marginally increased in the last few years. Between 2011 and 2015 there was a 1% increase in the number of children with SEN admitted to hospital. This does not mean they are being admitted due to their condition but provides a useful indication of rising demand. Congenital malformations, deformation and chromosomal abnormalities accounted for the highest proportion of hospital admissions in 2014/15. Diseases of the ear and mastoid process used to account for the highest proportion and this has fallen since 2011/12. These conditions may or may not all lead to SEN assessments so children with these diagnoses may still be monitored in the educational system. Reigate and Banstead has seen the highest proportion of admissions, followed by Elmbridge. This contrasts to the numbers of high birth rates in each district and borough where Runnymede and Spelthorne have a higher proportion of children born with a low birth weight. Surrey data shows that there is a link between a low birth weight and a condition that could lead to a SEN assessment. 6.1% of the total number of children identified to have a condition that could lead to a SEND assessment are born with a low birth weight. There is a very strong link between those children with conditions originating in the perinatal period and a low birth weight with 70% of children in 2010/11 with a low birth weight diagnosed with a condition originating in the perinatal period. There are about 855 infants a year born with low birth weight in Surrey. 1 out of 5 are considered to be of a very low birth weight (less than 1500 grams). Surrey has seen a rise in very low birth weights since 2010. There is a link between low birth weight and likelihood of disability, therefore it makes sense that the districts and boroughs that see a high prevalence of disability, such as Runnymede (70%), Spelthorne (69.1%) and Reigate and Banstead (63.8%) all have a high prevalence of low birth weight, above the Surrey average. The number of children 0-18 admitted to hospital for reasons related to asthma or epilepsy are below the England comparison. Surrey is higher than the regional comparison for admissions for asthma however. The number of children on the disability register has increased marginally over the past 3 years from 2,020 in 2013 to 2,048 in 2015. The majority of needs are learning difficulty/disability related but there are also large percentages with cerebral palsy, physical disabilities and disabilities related to developmental delays. In 2015, for the placements in NMIs, 10 out of 724 were part funded by health (1.4%). As at May 2015 there were 9,770 children and young people (0-24) receiving disability living allowance in Surrey. Seven in ten looked after children who have been looked after for at least 12 months have some form of SEND. There is a significant overlap between children, young people and families coming to the attention of Children’s Services and those with Education, Health and Care Plans. In October 2015, there were 490 students (17%) with a plan in contact with children services, the majority (65%) are in contact with the Children with Disabilities team (CWD). Where there are families facing complex, multiple needs it is important that holistic and coordinated approaches are taken. In 2014, national statistical returns show that Surrey has a higher proportion of children in need with disabilities at 18.4%. This is a contrast to the previous 3 years where Surrey actually had fewer than the statistical neighbours. The largest number of children with a disability known to social care are those with learning and personal care needs. This has been consistent across the past 3 years. There are 823 children aged 0-19 in Surrey that are receiving a service from the Children With Disabilities (CWD) team. The age cohort 10-14 is the largest group receiving support (34%). Understanding the variations in need across Surrey’s districts and boroughs could be key to ensuring Surrey and its partners are providing a consistent service across the county. Recorded needs by the CWD teams reveal a high proportion of children with learning, communication and autism. Despite relatively lower numbers of children with mobility disabilities recorded on EHCPs, this is still a high need group for children with social care. Out of the 824 children and young people supported by the Children with Disabilities team, 57 (7%) of them are looked after children with a disability. 84% of these have a learning, communication or associated disability. 68% were children in need due to the child’s disability. The majority of children supported by the CWD teams were aged 10-17 (88%), with 38% aged either 16 or 17. Since 2013, more children with disabilities are living with a Surrey foster carer and far fewer are living within independent foster provision. The number of children with disabilities living in a residential school has remained stable from 2013-15. There are 720 children with ASD in National Curriculum Year 7 to 15 and only 129 (18%) have had needs that mean that they are known to social care services. This shows the range of need within this group. Year 13 has the most children in contact with social services with 35% and year 15 has the least with just 10%, but is likely to be due to children being transferred to the adult social care team as they become older. The number of people on the adult transition team caseload has increased by nearly 50% in the past 4 years, partially by design as the team now no longer refers cases but continues to work with them. The number of people with learning disabilities far outweighs those that have needs due to mental health or physical or sensory disabilities. Over 2000 children and young people with SEND access short break services, while approximately 400 families receive direct payments to commission their own support packages. 300 families received a Merlin Pass last year and around 225 families received carers breaks of up to £500 per family. The most common primary disability of children accessing short break services is children with Autistic Spectrum Disorder (35% compared with 14.5% children with severe learning disability, the second highest group). The local authority does not directly fund individual packages for children on SEN support in the same way as they do for children with EHCPs. However, the way the support is delivered to intervene early to meet need can make a real difference, promoting development and reducing the impact of SEND on a child or young person’s future outcomes. As such, SEN support is a key part of early help for families. There are 16,540 children with SEN support, School Action and School Action Plus in Surrey maintained schools in Surrey, excluding all independent schools and colleges (this is a total of nearly 40,000 additional pupils). The transfer to SEN support is happening quickly with 11,169 out of the 16,540 already on SEN support. The South East has the highest prevalence of children with all types of support with 5,837, the South West has the least with 4,779. South West has more pupils on School Action and School Action Plus comparatively (742, 571 in SW vs 664 and 573 in SE). The number of pupils on SEN support in Surrey maintained schools has declined over the past 3 years. This could in part be put down to the changes in legislation that has combined both School Action and School Action Plus which may mean children are being reassessed. While pockets of good practice were identified, the analysis of feedback from parents, carers and young people in need of SEND services highlighted an uneven and fragmented experience of the system. Problems are not identified or accepted early enough. Staff need more training around SEND. Parents may choose to appeal a decision made by the Local Education Authority (LEA) about their child’s Special Educational Needs and Disabilities (SEND). The tribunal process is independent of government and will listen to both sides of the argument before making a decision. An analysis of appeals for the period 2012 to 2014 (36) found that nationally, Surrey ranked high among other LAs for number of appeals registered per 10,000 of school population (as they had a large number of appeals). The majority of appeals are for children with Autistic Spectrum Disorders, Speech, Language and Communication Needs, and Moderate Learning Difficulties. The analysis identified the need for further work to understand the issues affecting the customer experience at this stage. As a result of the SEND reforms in the Children and Families Act 2014 and the introduction of ECHPs for children aged up to 25 with an annual review and right to tribunal, there may be increased expectations that education will go up to age 25, with potential for increased tribunal/legal activity. Sufficient quality provision to meet local need is also an important factor in preventing tribunal activity. Current services in relation to need. This section of the JSNA chapter provides an overview of key services. Further information can be found on Surrey’s local offer website,www.surreysendlo.co.uk. The websiteprovides information about all the services available in Surrey for children and young people with special educational needs and/or disabilities (SEND) aged 0 to 25 and those outside of the county that Surrey County Council is also responsible for. improve outcomes for our children, young people and families. The Family Information Service offers a free impartial information service for families with children aged 0 to 19 (and up to 25 for young people with a disability or special educational need). SSIASS (Surrey SEND Information, Advice and Support Service) provides independent advice and support for young people and parents/carers of children and with SEND aged 0 to 25. Surrey’s short breaks directory can be visited at www.surreycc.gov.uk/shortbreaks. transport for pre-school children with SEND. The Surrey Early Support Service for young children with disabilities can also help families needing extra help raising a child with disabilities and special needs and anyone who works regularly with these children and their families. Surrey County Council’s Area Sector Development Improvement Advisors support early years’ providers in the private, voluntary and independent sector in identifying the special educational needs of their pupils. They do this working with the advisors for each setting, offering advice on outcomes for the child, giving guidance on SEND processes and meeting with parents. An Early Years SEND banding document is also available to help identify the provision required to support children with Additional and Special Educational Needs and Disabilities (ASEND). Children with SEND are educated in local mainstream schools in Surrey whenever possible, and have access to the National Curriculum wherever possible. In order to provide early intervention and avoid bureaucracy, schools have money in their budget which they can use to fund up to the first £10,000 of additional support arrangements needed by a pupil. With this targeted support, the majority of pupils will be able to achieve their outcomes. Settings should review the effectiveness of what is happening and consider the need for further assessment and whether there should be any changes to the support provided in line with the graduated response referenced earlier in this paper. The types of support provided could include small group teaching, extra equipment or support from a speech and language therapist. SEN support has recently replaced the previous categories of School Action and School Action Plus. The needs of post 16 young people in Further Education Colleges, Sixth Form Colleges and Independent Specialist Colleges have usually been identified before they attend the college. Pathways Advisors work with young people and their families from year 9 onwards providing information, advice and guidance at key educational transition stages for young people with statutory plans. Pathways Advisors liaise closely with educational establishments and other Surrey agencies (e.g. Social Care) in order to provide a client centred approach and ensure the young person receives an appropriate support package to address needs and enable them to successfully transition in to their chosen education, training or employment options. Young people are funded on an individual basis, dependent on need highlighted by the college in their pre-entry assessment. Young people are funded through the High Needs Student funding; in order to access this funding, the college must provide evidence of support requirements in the young person’s Individual Placement Agreement (IPA). In order to be eligible for this funding the IPA must evidence support costs of over £11,000. Work is continuing on the development of a new speech and language therapy (SLT) service for children and young people in Surrey, in partnership with Guildford and Waverley CCG. The council and Surrey clinical commissioning groups have committed to implementing a single SLT service. The new service is planned to be running by April 2017. Surrey County Council will provide home to school transport if a child or young person with SEND meets the criteria for distance and journey type, and is attending the nearest appropriate place of education. This is arranged as part of the placement process. Surrey County Council is currently updating its travel assistance policy for children and young people with a statutory plan. Health services for children and young people with SEN or disabilities provide early identification, assessment and diagnosis, intervention and review for children and young people with long-term conditions and disabilities, for example chronic fatigue syndrome, anxiety disorders or life-threatening conditions such as inoperable heart disease. Services are delivered by health professionals including paediatricians, psychiatrists, nurses and allied health professionals such as occupational therapists, speech and language therapists, rehabilitation trainers, physiotherapists and psychologists. In addition, public health services for children ensure a whole population approach to health and wellbeing including preventative services such as immunisation for the whole population and targeted immunisation for the most vulnerable. There are several areas where health and local authority joins up in providing services to the child or young person with additional needs and Clinical Commissioning Groups (CCGs), NHS Trusts and NHS Foundation Trusts have a statutory duty to inform the appropriate local authority if they identify a child under school age as having, or probably having, a disability or SEN.
For every assessment of a statutory plan, health has been asked to provide some form of evidence to the process prior to the transfer to EHCPs. The health teams will always return some information even if it is to say that the young person does not have a health need. If the health team has not seen the young person before then they will request a health check-up. Therefore, all children going through an assessment have contact with health teams at some point. Children with SEND may receive social care support from, or in addition to, support within schools. Social Care services have responsibilities to communicate effectively with schools and ensure appropriate provision under what is specified in the EHCP. The arrangements for assessing and meeting the education and health needs of looked after children and care leavers are coordinated within the process of care and pathway planning. Short breaks provide essential opportunities for young people with SEND to have the same experiences as their peers and provides families the opportunities to have some respite. Surrey commissions short breaks provision through voluntary organisations and also directly provides its own services. Short breaks are open to children and young people of all ages, up to 25 but it can be dependent on the specific service as to what age range is catered for. The level of need of the child also dictates what services that can access. A range of short break services were re-commissioned in 2014 for a period of four years with the aim of continuing to meet the needs of disabled children and young people and their families in Surrey. Play and Leisure Services which provide disabled children and young people with access to a wide range of experiences and opportunities. These are designed to enable disabled children and young people to have fun, socialise, learn new skills and have the same opportunities as non-disabled peers. Personal Support Services which provide disabled children and young people with an individual support service that is personalised to meet their individual needs. Personal support ranges from providing personal care in the child’s home to support in accessing community and leisure opportunities. Residential Services which take place in settings as much like home as possible. Skilled and experienced staff provide disabled children and young people with the opportunity to interact with others, develop life, independence and communication skills whilst giving their families a break from caring. Breaks Directory by visiting www.surreycc.gov.uk/shortbreaks. This section of the JSNA chapter summarises the key learning points from each of these visits, which have informed Surrey’s SEND 2020 Programme. Wiltshire separated its commissioning and operational functions in 2013 creating a single 0-25 commissioning team made up Education, Health and Social Care commissioners overseen by a Head of Commissioning role. a more flexible divide between statutory EHCP and non-statutory so parents did not feel the need for an EHCP and trusted that they will receive the support their child needs. transformation of short breaks provision through allocation of personal ‘short break’ budgets to families, and strong parent participation. creation of a parent partnership agreement. Achieving for Children (AfC) is a social enterprise company created by Kingston and Richmond Councils to provide their children’s services. There is one SEND system which sits within early help services alongside an integrated youth and family support service. SEN case officers are involved in a Team around the Child (TAC) approach. Joint health and social care commissioning arrangements in place underpinned by section 75 agreements and good partnership working across the CCG and local authority. Pooled budgets are in place for both an integrated health and social care disabilities services, and a short breaks, speech and language service. SEN case officers are involved in Team around the Child (TAC) approach and meetings. Through the TAC approach, professionals such as the SEN case officers, step in and out of the team rather than the family feeling they are moving through steps in a process or being pushed from one service to another. This is similar to Suffolk County Council’s model. Transition team offers support to children with SEND from 16 plus creating clearer pathways into adulthood. A Single Point of Access team (SPA) offering a multi-agency front door to all services. Early Help Workers operate in locality model across Richmond and Kingston upon Thames, working for between 6 to 9 months with families. Family support (early help) is split into two distinct age ranges: 0-11 and 11 – 19 with co-located education psychologists. Hertfordshire has 9 SEND Delivering Special Provision Locally (DSPL) areas. Each area has a small DSPL area group, comprising head teachers, parents and local authority officers, which produces an area delivery plan. This model of devolution has been key to securing greater inclusivity and reduced reliance on NMIs. Extensive engagement with schools, development of local school clusters, devolving of some decision making and limited budgets (£3m county-wide) and investment in local provision and staff development – particularly around behaviour, autism and speech and language. introduction of an exceptional needs funding model to ensure young people stay in mainstream. Gloucester County Council is about to restructure to a 0-25 service. There is one Head of SEND reporting to the Director of Childrens service. There is a centralised team of case workers in one building. There are no area/geographical teams, the structure is based on function. There is a clear separation between casework functions and administration which contributed to 100% EHCP transfers within the 20-week timeframe, freeing up caseworkers. Good working arrangements with providers. Has built confidence in schools to work with SEN. Introduced SENCO clusters offering opportunity for termly meetings to problem solve, training, national and local updates, briefings from leadership. Established a ‘graduated’ early help pathway with investment in the early years. 200/300 children now identified early and supported through a Team around the Family approach. Early help system to be aligned with SEND. Piloting ‘Amazon style’ review process on the local offer website. Essex County Council overcame a backlog of EHCP transfers by acknowledging that a 20 week transfer would not be met, but focussed on ensuring a review meeting took place with the individual. The SEND programme manager invested time in understanding why transfers would not be achieved, while maintaining confidence in a person-centred approach. Delays in health assessments were identified along with confusion over who to contact. ‘One planning’ approach to reviews to ensure that everyone can sit round the table so have started to share information virtually. Concentration on co-producing the local offer with parents, and ensuring robust communication and consultation. A dedicated officer to work on LO. A strong ‘SEND’ voice across Essex’s governance structure. A SEND commissioning strategy is currently being developed and the commissioning opportunities and intentions will be outlined in the strategy. In a joint partnership workshop on 16 March 2016, Surrey County Council and its partners, as part of the work to reshape the local offer, reviewed the analysis of need undertaken by Surrey County Council in 2015/16. Ensure young people are educated closer to home, in provision that is appropriate to their education, health and care needs, delivers quality outcomes and offers good value for money (37). Journal article: Surname Initial(s). Title of article. Journal title/or title abbreviation. Year; volume (issue): page(s). 3. Surrey County Council (2016) ‘The SEND challenge: growing levels of need: Needs analysis summary’, Headline 11. 15. 2015 SEN2 Return and School Census. Exact figures can be confusing because there is a distinction between the number of statements maintained by Surrey where pupils attend school outside the county or NMIs, and those who are educated within Surrey but their statements are maintained by another council. 17. Surrey County Council (2016) ‘The SEND challenge: growing levels of need: Needs analysis summary’. 19. Surrey County Council (2016) ‘The SEND challenge: growing levels of need: Needs analysis summary’. 20. The analysis was based on the most recent six years of data, taking into account expected changes in the demographics for this age group, together with known housing developments). There is a high degree of uncertainty when projecting over a ten-year period, and it will be important to continue to update projections with new data as it becomes available. These projections are for school-aged children aged up to 16 and are being developed for the 0-25 population. 25. School Census PLASC January 2015, SFR 25 2015 National Data. 28. This could however partly be due to an issue with the quality of data recording. 29. Independent Specialist Colleges (ISCs) provide education and support to young people post-16 who have some of the most complex needs.